With a solar eclipse taking place today, I am somewhat surprised that I have not heard more about the rapture from the local evangelical fundamentalist Christians. Then again, I have been busy and have not invested much time perusing the various platforms they use for disseminating their views. Perhaps there has been a big hoopla about the rapture taking place today, and I've just missed it. But I doubt it. I am reasonably confident that I would have seen plenty of atheists mocking it on Twitter by now. 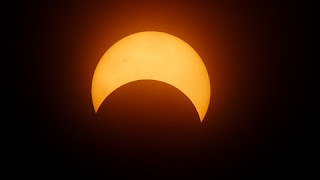 The combination of anti-science views, belief in the supernatural, and a tendency to filter the world into good and evil makes me wonder if some evangelical fundamentalist Christians will be terrified when the sun is at least partially eclipsed today (I do not live in the direct path where the eclipse will be total, so a partial one is all we get to see here). So far, this does not seem to be the case. Aside from the very small number of end-of-the-world grumblings I have heard on the fringes, many of the local Christians seem to fall somewhere between indifference and excitement over the eclipse. Some parents are even pulling their kids out of school to enjoy it with them. Since I have had too few recent occasions to feel optimistic about much of anything, I'm going to allow myself to think that the lack of panic observed among evangelical fundamentalist Christians might reflect progress. Maybe some are finally beginning to be able to appreciate natural phenomena without having to dress them up with various gods. Yeah, I know. But just for today, that's what I am going to tell myself. I am also going to be optimistic that the eclipse might temporarily give the cable news media something else to talk about besides our president. It would be great to see CNN replace the political analysts and pundits with scientists for at least a day. Now if that doesn't make me sound naively optimistic, I'm not sure what would!